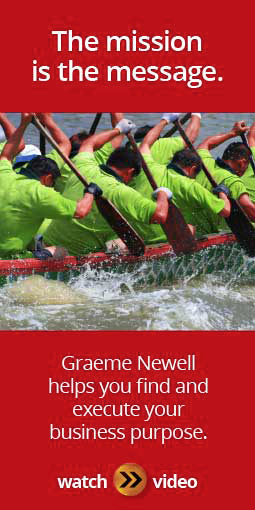 Graeme Newell is a researcher, speaker and author who guides businesses in finding and implementing their authentic business purpose. Graeme and his research team of emotional attachment experts uncover the deeply-held beliefs of customers and employees. He then helps build management and marketing systems that bring purpose to life. Graeme’s company, 602 Communications, has done research and consulting for some of the world’s most purpose-driven companies including GE, CNN, Sony, Disney, Metlife, CBS, News Corp, CNBC, and Madison Square Garden. Drawing from a library that includes more than 50,000 marketing examples, Graeme’s most popular presentations take audiences on an emotional journey through the most powerful instinctual motivations. He helps business leaders understand the often hidden drivers of build strong customer loyalty. He reveals specific tactics that turn indifferent stakeholders into loyal fans. Graeme helps his clients achieve passionate customer loyalty through research, speaking, writing, conference presentations, and training workshops.